Hee hee, look at that silly face! 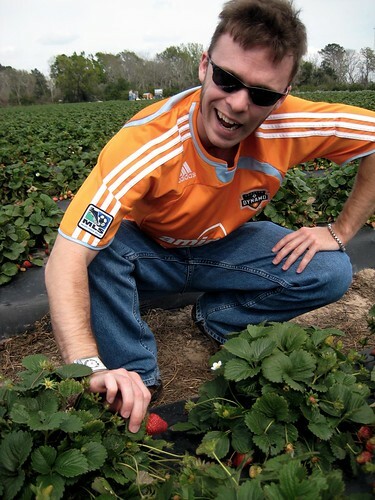 Nicholas and I stopped by Froberg's Veggie and Fruit Farm to pick fresh strawberries before the Dynamo season opener (hence the jersey). 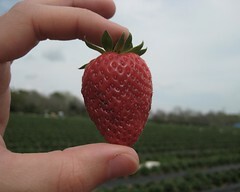 They have nearly 10 acres of farm land and a nice sized grocery store to pick up the freshes of fruity goodness. 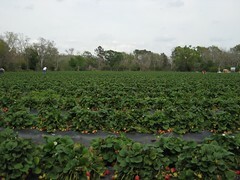 Look at the miles and miles of fresh strawberries! Yumm. 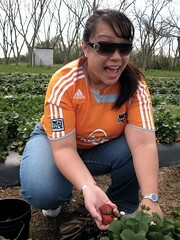 We also picked up one of their honeydews - a delicious ball of sugary goodness.